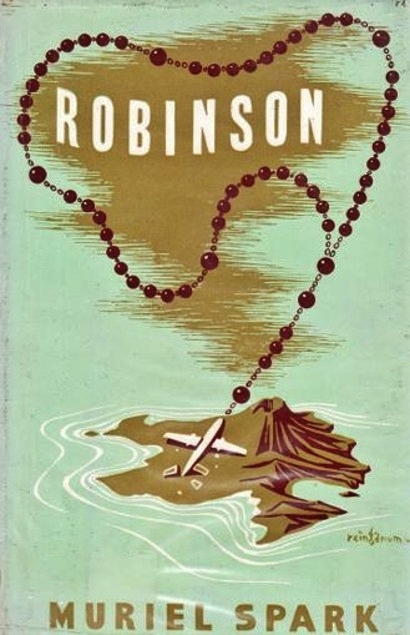 Robinson by Muriel Spark: An apochryphal island? 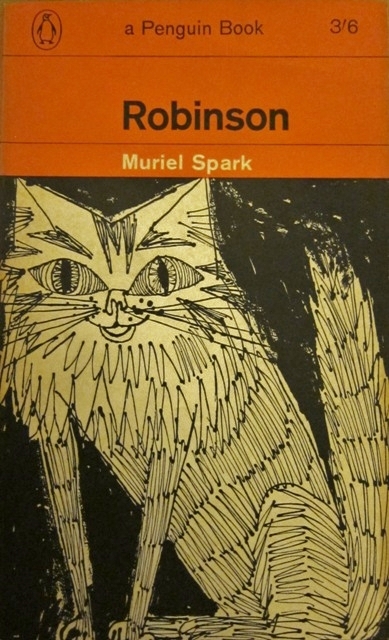 Robinson by Muriel Spark ~ 1958. This edition: Penguin, 1987. Paperback. 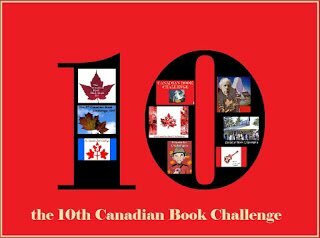 ISBN: 0-14-002157-4. 175 pages. 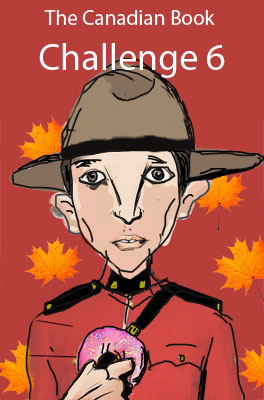 I’m not sure who this is supposed to represent; none of the male characters in the novel struck me as even slightly resembling this melancholy fellow. One must assume it is supposed to be Robinson himself, and then gently avert the eyes. I did wish to go home, but not that I had never come away. If I had stayed at home, there might have been a fire in the house, or I might have been run over, or murdered, or have committed a mortal sin. There is no absolute method of judging whether one course of action is less dangerous than another. En route to the Azores, a small passenger airliner crashes on a tiny Atlantic island. Twenty-six people perish; three are thrown free and survive, to be nursed back to health by the reclusive ex-priest Miles Mary Robinson and his young ward Miguel. The island Robinson, named after its most recent owner, once was home to a thriving small community of productive farms and orchards, but all that now remains is a barely surviving pomegranate orchard, the crop of which is harvested by a crew of workers who visit once a year by ship, to take off the fruit and deliver Robinson his year’s supply of canned food. The boat carrying the harvesters is due in three months, and as there is no way of contacting the outside world – Robinson has no radio set and disclaims any desire for such intrusive devices – the castaways settle down to wait out their ninety days. Our narrator, January Marlow, is a young widow with a teenage son. She ran away from school to be clandestinely married; her much older husband died within six months of the wedding, leaving widow and as-yet-unborn child with a modest inheritance. She has created a satisfactory life for herself, working as a freelance writer; she was researching a book on islands, which accounts for her presence on the doomed airplane. The two other survivors are men. Jimmie Waterford is the charming and seemingly vague cousin of Robinson, Tom Wells a smarmy publisher of a spiritualist magazine, with a suitcase full of good luck charms and a packet of secret papers. At first the new society ticks along reasonably well. The men supplement Robinson’s fast-dwindling food supply by fishing and the odd wild bird or rabbit shot for the pot. There’s also a goat, who provides milk. January wonders why Robinson doesn’t grow any vegetables, as the climate of the island is perfect for a wide variety of crops. She inquires, and Robinson brushes off her hints. 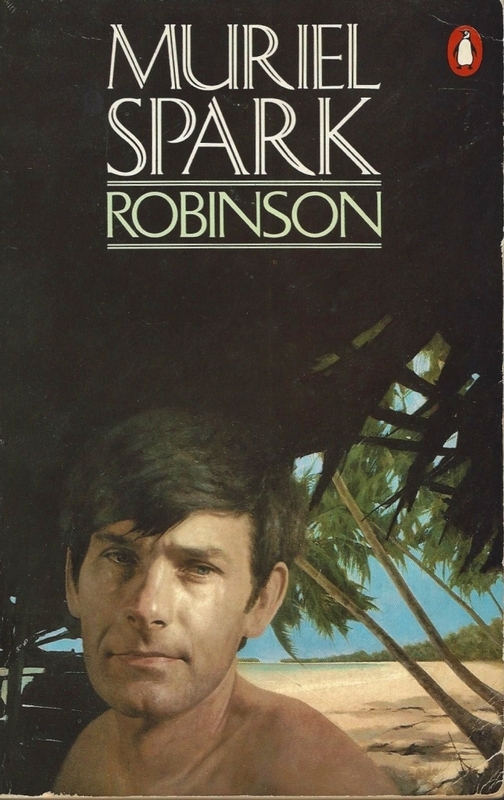 As injuries heal, cigarettes are rationed, and boredom sets in, tensions among the four adults start to rise, the most serious of which are wound up by Robinson’s strict religious views. 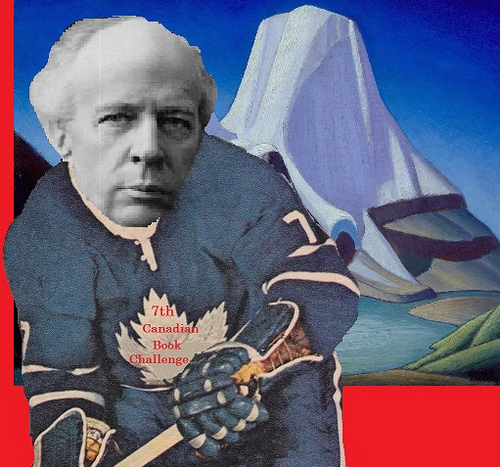 A Roman-Catholic of strong anti-Marian beliefs, Robinson scorns both January’s rosary and Tom’s collection of superstition-promoting good luck medals. Young Miguel is fascinated by both, causing Robinson to take firm steps to remove such temptations from the reach of his young protegé, whom he is educating in his own ascetic beliefs. Secret tunnels, shark infested surrounding waters, and a volcanic fissure in the rocks known as the Furnace add to the atmosphere of potential impending doom. Not to mention the presence of the wrecked plane, the twenty-six shallow graves, and the macabre collection of fire-scorched “salvage”. Tempers are ever tighter; hasty words are spoken. And then one day a trail of blood and bloodied clothing is discovered by a hysterical Miguel. It leads to the edge of the Furnace. Robinson is nowhere to be found. Who killed Robinson? And why? The survivors eye each other with deep suspicion; speculation turns to open accusation. Will another act of violence occur? After converting to Catholicism in 1954, religion was very much on Muriel Spark’s mind; she used her fictions as the backdrop to numerous theological discussions all the way through her writing career, something she had in common with her literary mentor Graham Greene. A cover artist’s rendition of the charming Bluebell, cat of many sterling qualities and unexpected talents. This is an utterly odd book in so many ways, as are so many of Spark’s novels. It’s also an extremely clever, strangely engaging, and darkly humorous one – a ping-pong-playing, water-loving cat adds charm and comic relief to some of the bleaker passages – and (to use an apt cliché) one can’t look away. Our possibly murderous castaways are rescued at the 11th hour, after some startling developments, and the last we hear of Robinson-the-island, rumoured relic of Atlantis, it is sinking beneath the ocean waves. Was it ever a real place, wonders January? Did all that really happen? First edition dust jacket, one of the most pleasing examples of well thought out and aesthetically pleasing cover illustration I’ve come across in a very long time. Posthumous cheers then to Dame Muriel, whose 100th anniversary of birth is coming up in just a few days, February 1, 2018. The literary world is gently buzzing with tributes; Muriel Spark’s books are being dusted off and republished in new editions, and read and re-read by devotees new and old. Reviews are already showing up in enthusiastic profusion online; I add my own to the list, and I will doubtless be joining a host of other readers revisiting Muriel Spark in greater depth as the year progresses. My own personal rating for Robinson: 7.5/10. Lovely review. It really is a ‘can’t look away book’ isn’t it? Also a very clever novel, which I think I said somewhere else would make a great book group read. Yes, indeed! 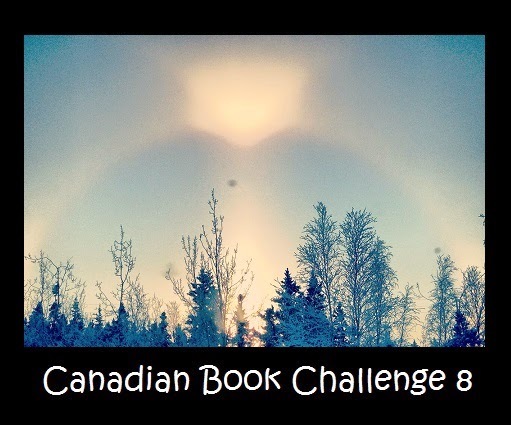 It is open to much discussion – great book group choice. I’d never heard of this book and it sounds interesting. I lile the way that the island is shaped like the outline of a body drawn by the police in a murder scene. Isn’t that island map great? 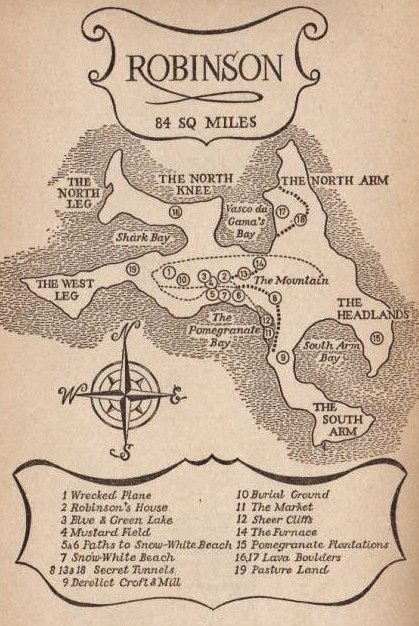 And like the map, Robinson is an interesting book, full of not-that-hidden subtexts, but working well on all levels. It’s great, isn’t it? Multi layered, like all Spark’s work. And yes – that cover was hard to deal with (hence the post its I deployed). I wish mine had had that lovely hardback dustjacket. I liked it so much more than I thought I might. And yes, that original hardback dj – perfect. Now this is much more to my taste than John Wyndham! It’s one of the few Spark novels I haven’t read but, after reading your review, and those by Karen and HeavenAli, it is now nestling on the Kindlewaiting to to be read.